El Raval is a neighbourhood of high contrasts: currently the largest example of gentrification (together with Poblenou) in Barcelona, still retains its character and strong personality that make it so famous, and gathers several contemporary architectural works that makes it a hybrid picture where tradition and modernity coexist harmoniously. We only have to visit the surroundings of El Raval district to realize what it contains within: on the one hand, we can appreciate the famous Ramblas located on the right hand side, which hardly need any introduction. The Ramblas end at the Drassanes (dockyard) that host the Maritime Museum. The west side is flanked by the final stretch of the avenue “Avinguda Paralel”, famous for its nightlife and variety of theaters. 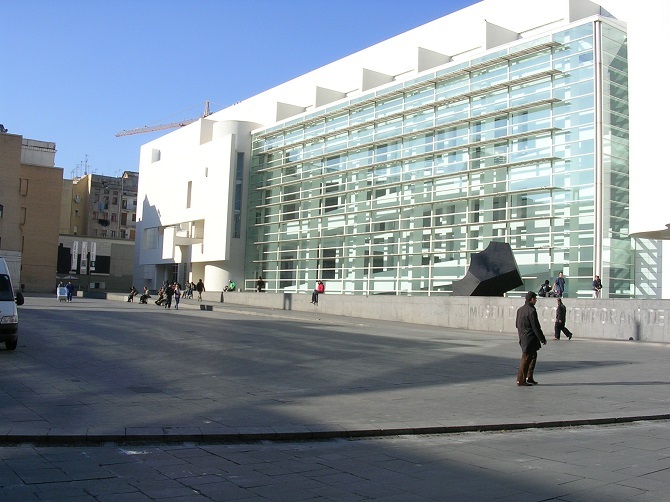 And, finally, on the north, we can find the spotlight of the contemporary flagship of Barcelona that are the MACBA (Barcelona Museum of Contemporary Art) and the CCCB (Centre of Contemporary Culture of Barcelona). 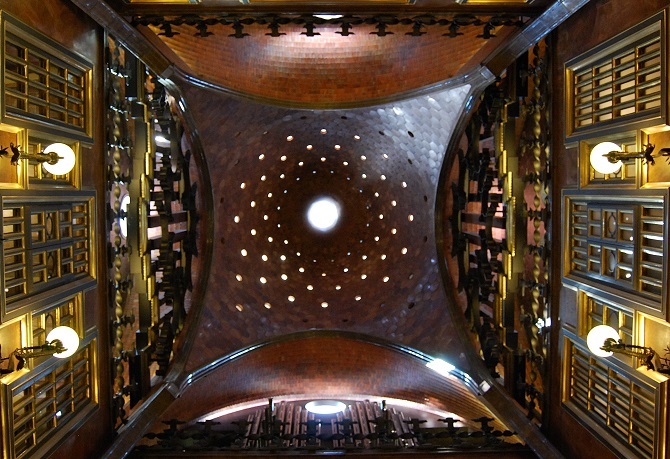 Palau Güell: Gaudí mark can be appreciated in this emblematic district with its palace built for the industrial family Güell, who fostered his skills and potential. Pay attention to its beautiful façade of stone balconies and the interior, where an impressive dome receives us and prepares us for the whole architectural beauty that we will witness. House of Mercy: an ancient medieval religious hospice, from which we can see three buildings: the hospice, the former College of Sant Guillem d’Aquitaine and the church attached to it. 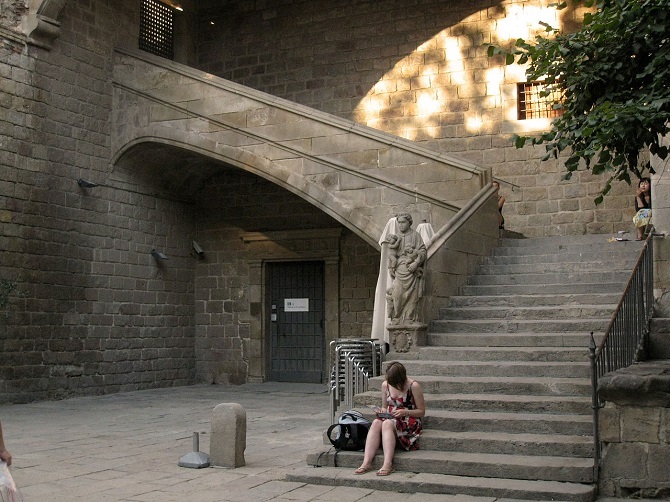 Complex of the Hospital de la Santa Creu: it used to be an old medieval hospital, but nowadays is a restored enclosure that houses, among other institutions, the National Library of Catalonia. This beautiful courtyard is a must see after paying a visit to the Boqueria market, which stands right behind it. 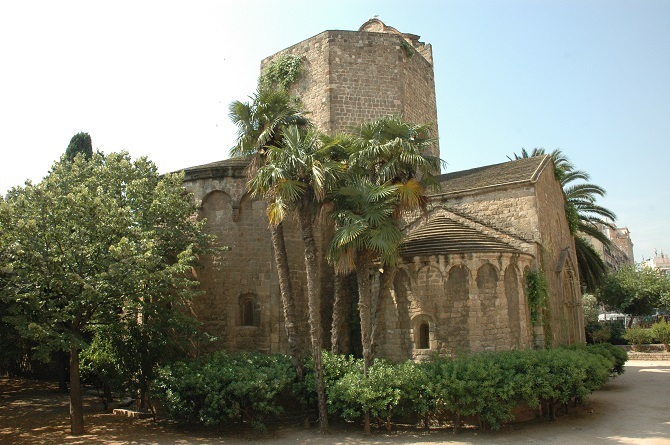 Convent de Sant Agustí: in the square of the same name and bearing the same charm, we found an idyllic environment consisting of a façade of an unfinished church, gardens, benches to rest and one of the typical streetlight-fountains, very common around the city. In its surroundings there’s the Fonda España, a modernist hostel, created by Lluis Domenech i Montaner, rival architect of Gaudi for having the most beautiful works of Catalan Modernism. The Contemporary axis: at Plaza del Angels we can find the MACBA-CCCB axis: two buildings that house the finest collections of contemporary art and culture of Barcelona. It makes a wonderful contrast as you can see the “Convent of the Angels” nearby, a very classical building, and the beautiful forms of pristine white and glass of the MACBA building. Rambla del Raval: The Raval district could not stay without its own rambla. One of the last to be completed, is a mixture of modernity with examples like the Barceló Hotel, the Film Library of Catalonia and the funny Botero’s cat, and the contrast of being completely surrounded by buildings with a certain decadent air that make them priceless. Monastery of Sant Pau del Camp: located in the heart of Barcelona, we find this magnificent Romanesque building, a true wonder where it seems that the time has stopped, as if it had remained isolated throughout the centuries, oblivious to the bustle and evolution of the neighbourhood. 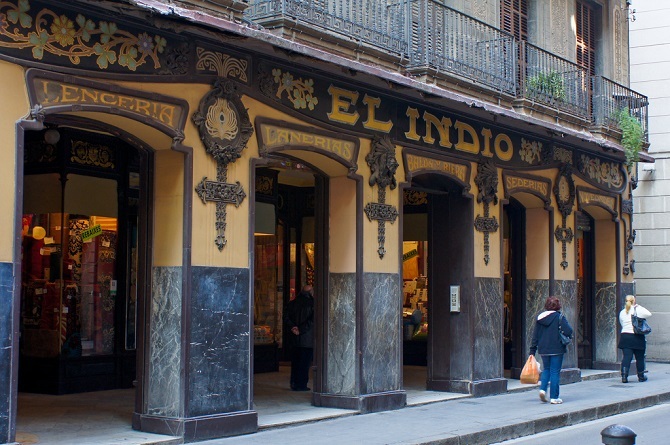 What to do in El Raval? El Raval is a neighbourhood where the main essence it’s in the streets and outdoors, do leave Barcelona without enjoying its outdoor terraces. 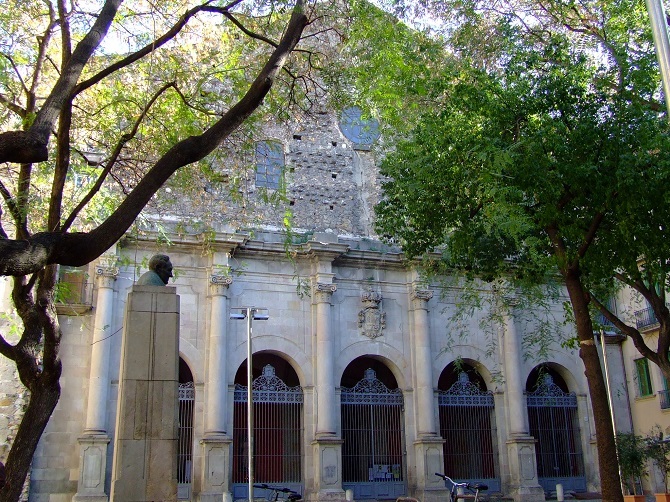 Regarding the festivities, the weekend before the celebration of “El Carmen” (July 16th) the Fiesta Mayor del Barrio takes place, a party where you can enjoy outdoor concerts, free guided tours, food fairs and many other activities. Around the first week of October (this year from Friday 7th to Thursday 13th) the Fiesta Mayor de La Rambla is celebrated in honor of the virgin “virgen del Rosario”, where we can see excellent examples of floral decorations. Finally, we must say that el Raval is the right place to make the most underground shopping in Barcelona, especially around the carrer Tallers, where we find shops of second-hand clothing, vinyls, vintage accessories and other bric-a-brac. Living for a few days in an apartment in El Raval is like living in the heart and soul of Barcelona. It is an ideal place for a tourism not only based on places to visit, but to live them fully. 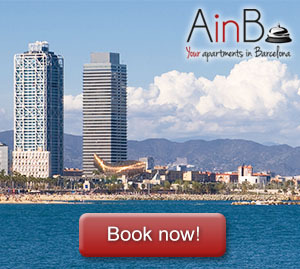 You’ll have the incredible Palau Güell at a stone’s throw from El Raval, and the Ramblas only three minutes away. 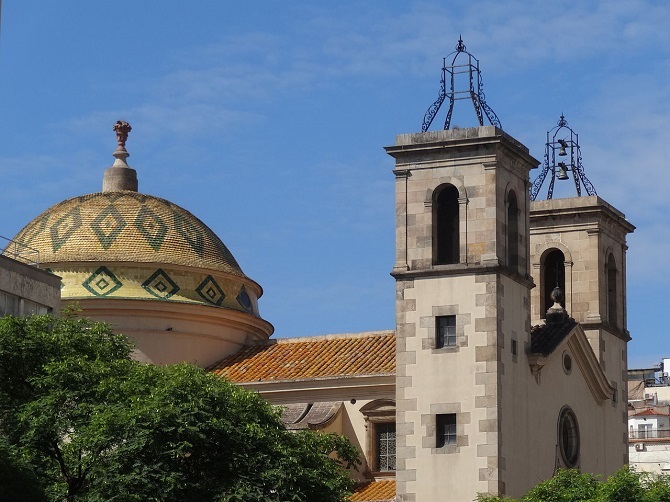 What is more, it is located five minutes from the Liceu subway station, which leads directly to other parts of the city as the compulsory visit to the Park Güell, the Passeig de Gracia or the Palau Reial. If you want to enjoy the most authentic and genuine Barcelona, don’t think it twice: El Raval is your neighbourhood. from the 4th to 11th octobre 2016 we spent seven nights at Muntaner B&B. We enjoyed an excellent service. A breakfast with muesli, croissants, omlets, tee, coffee … Very cleen rooms even the antique Elevator. We coud change to a quiet room with window to the back yard. The hoste’s name is Jinky. We will be back! Thank you so much for your words Felix & Jacqueline! We love visits like yours and we will be happy to welcome you again when you wish it. Greetings from Barcelona and we are waiting with open arms!